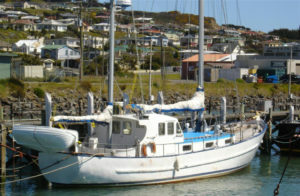 Easy to sail and a very comfortable live aboard yacht. She is constantly maintained and upgraded. Strong, safe and seaworthy. 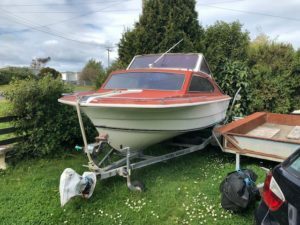 1974 by Alan Orams of Seaglass Marine, Whangarei, New Zealand to a L.Francis Herreshoff design, which was altered by Alan Orams resulting in less draft and wider beam. 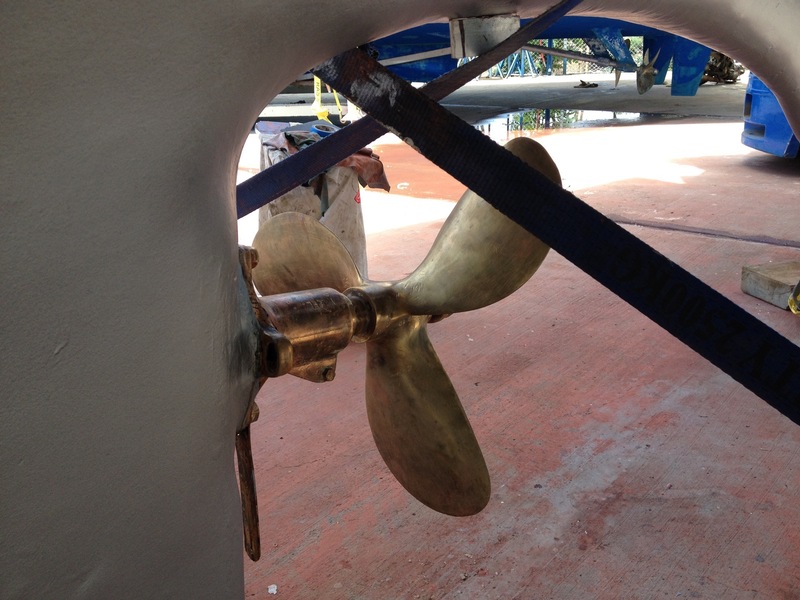 Full keel. 8T ballast. Nett 22T. Hull – Solid hand-laid GRP, with anti-osmosis treatment in 2008. Deck – teak. 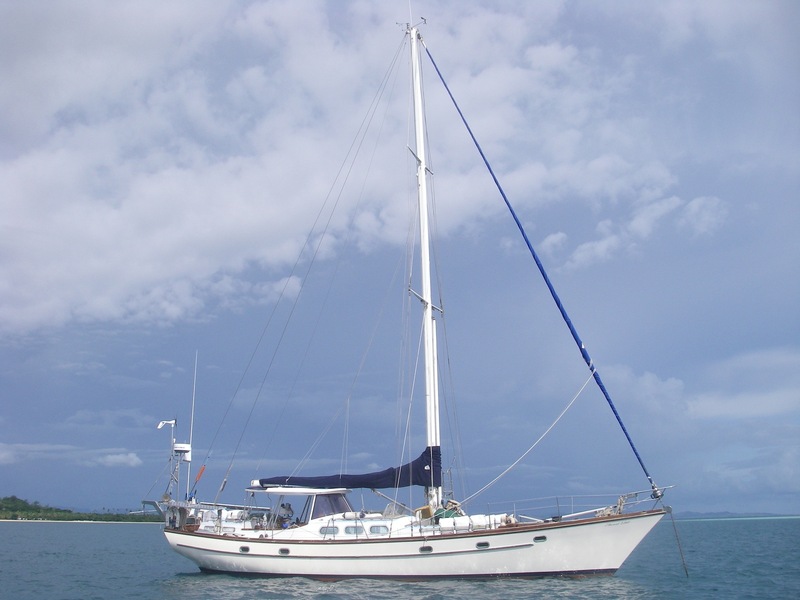 Luxurious blue water liveaboard cruising yacht, set up for single handed sailing and is located in Vanuatu ready for her new owner to start cruising straight away. NZ registered and NZ category 1 compliant. Extremely strongly built in hand laid GRP. 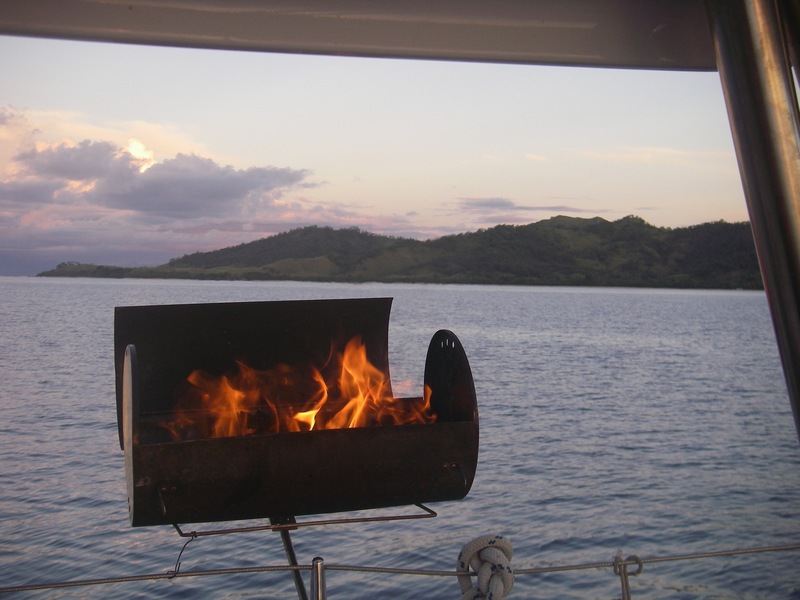 Imported into Vanuatu, which asset allows a new owner the option for a Residency Permit in Vanuatu. 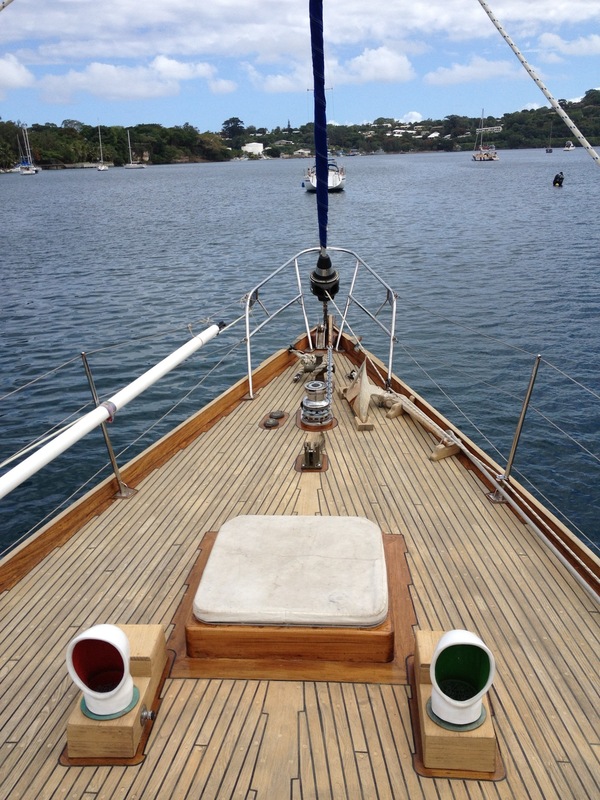 This is an extremely sturdy built and immaculately maintained cutter/sloop with beautiful classic lines. 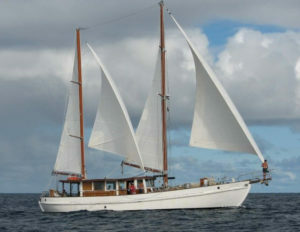 She was built by renowned boat builder Alan Orams in Whangarei, New Zealand following a Louis Francis Herreshoff design. (Sistership of Ticonderoga) She was commissioned in 1974 by her first owner as a bare hull with full headroom (as special order), fitted with only engine, teak decks and mast/rigging. 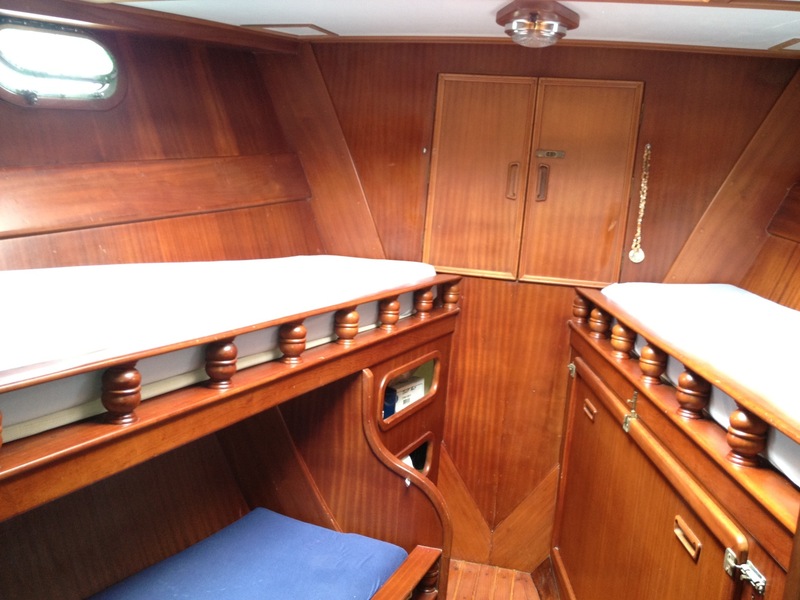 She was than sailed to Auckland to be finished with her luxurious and detailed mahogany interior by the first owner who was a professional joiner. Launched in 1979. Perkins 6354, 110hp. In good running condition. 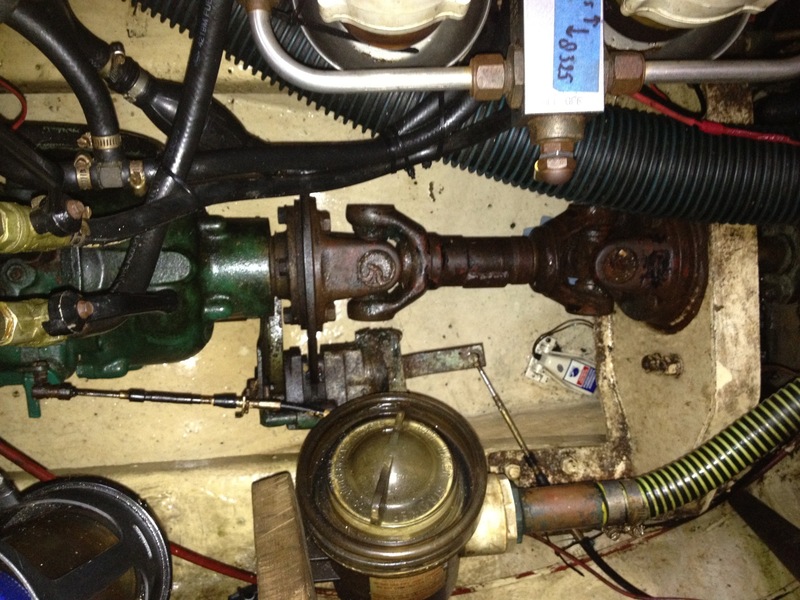 Propellor shaft with disc-brake..Heaps of spare parts on board; – filters, injection pumps, injectors, heat-exchanger, etc. 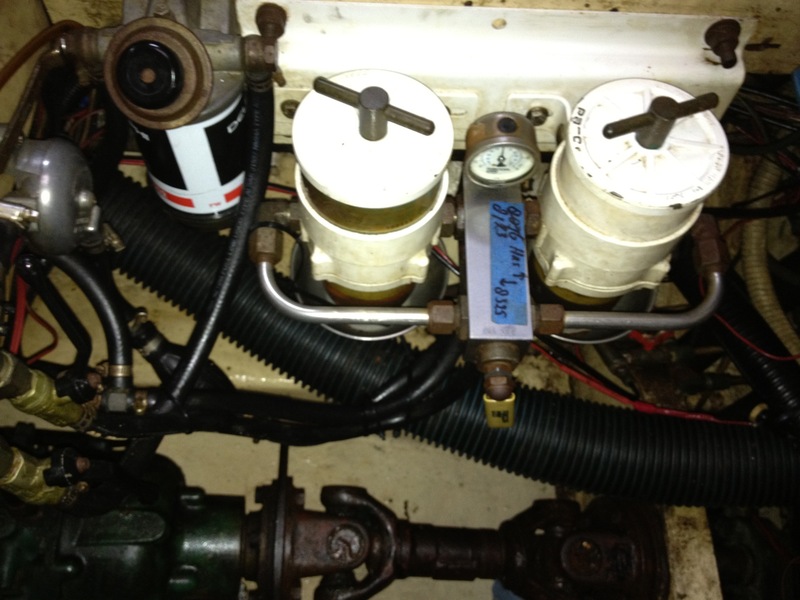 Fuel – 800 litres in 2 tanks, Racor filters. Water – 1200 litres in 4 tanks, Microlene drinking water filter. Black water and grey water holding tanks. Coming down the companion-way into the traditional and varnished saloon you will instantly feel "at home". Dark blue carpet and upholstery combine perfectly with classic varnished mahogany. To port-sid is a varnished dinner table seating 5/6 comfortably. Large lounge sofa on starboard with pipe berth on top. Aft to starboard is the navigation table with instruments, SSB, radar and autopilot repeater. 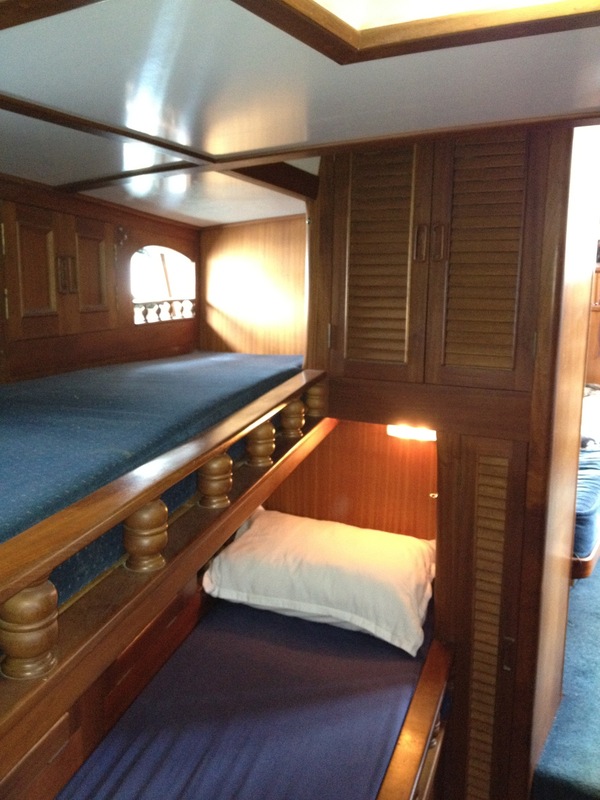 Aft of the navigation station is a single berth captain’s cabin with hanging locker. 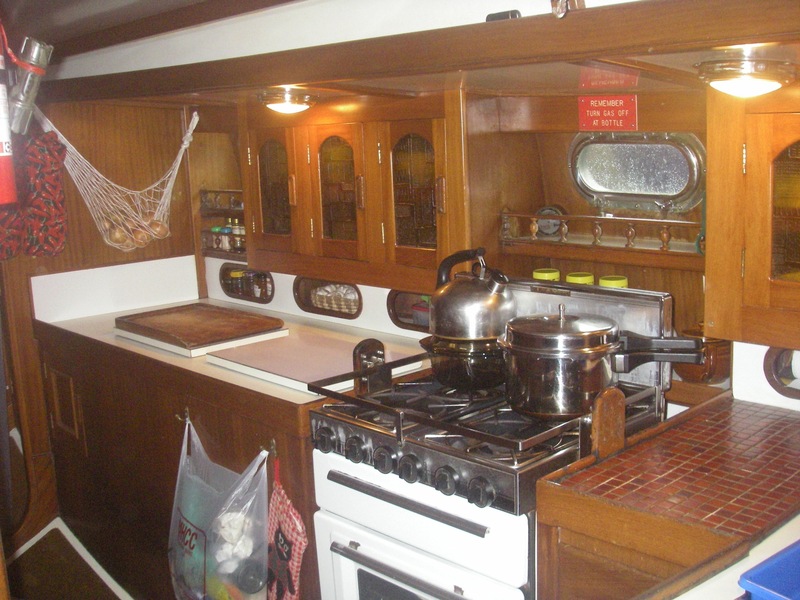 Aft to port is the fully equipped galley with ample work-space, fridge and freezer and 4 burner gas stove with oven. 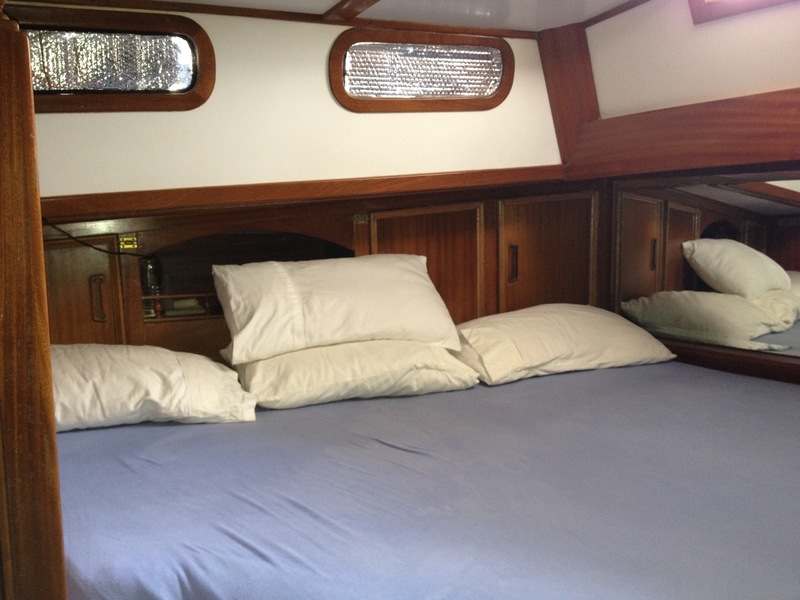 Aft through the galley is the master cabin with full width bed and a large mirror behind the bed, hanging wardrobe, separate toilet and ample storage lockers. 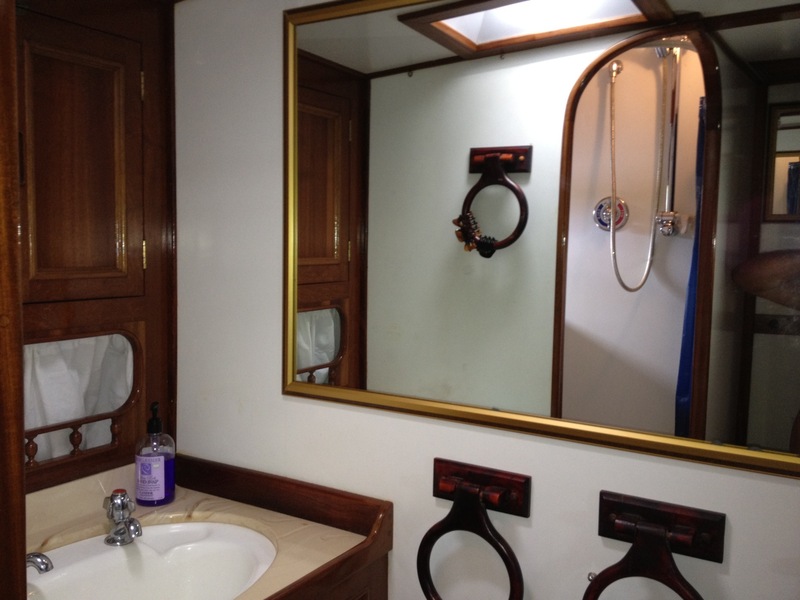 Forward of the saloon stepping down to port is the large bathroom with spacious shower and laundry basin, electric toilet, marble wash basin. Opposite the bathroom/mid-ships are two Pullman berths, cabin enclosed with curtain. 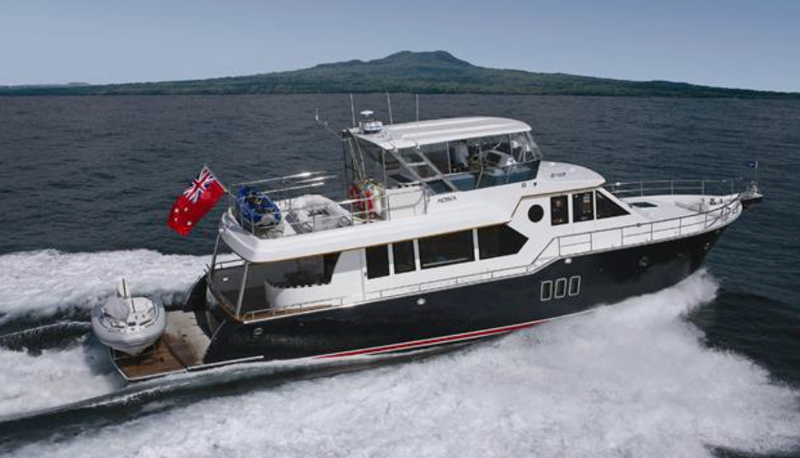 Forward is a 3 berth cabin with possibility to join the two top-berths into a very large full width bed. 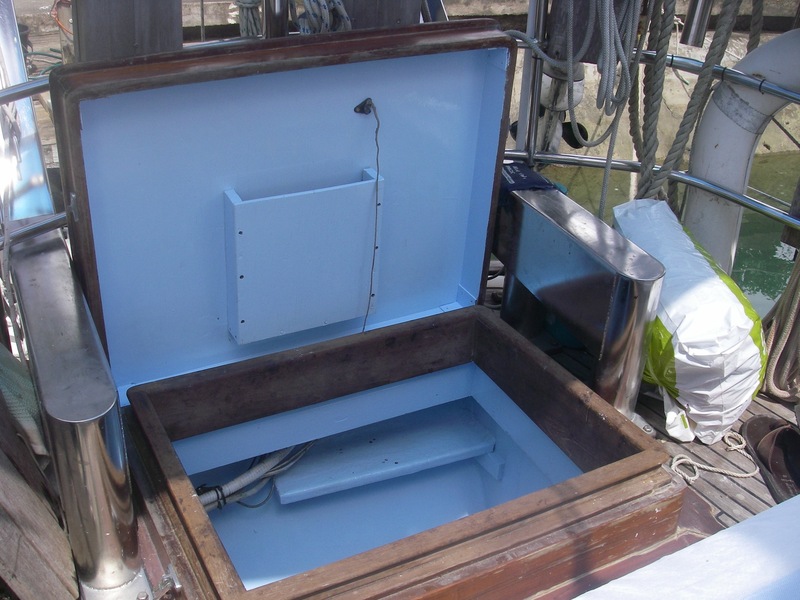 Sail-locker with anchor-chain locker and ample storage, life-vests etc. Dual refrigeration system: engine compressor driven and 24V air-cooled electrical. Front opening fridge with freezer compartment. Large freezer and separate day fridge compartment. Tinker Inflatable (sailing) dinghy Outboard: Honda 5hp 4 stroke. Custom made stainless steel davits. Maxwell 3500 24V electrical anchor winch with repeater on helm-station. 2x 75Lb CQR anchors (Manson NZ). 110m of 13mm galvanized chain (new 2012). 100 mtr anchor warp. Danforth anchor in locker forward. EPIRB GME MT400. Coast Guard safety jackets (10), 1x baby safety jacket. Hard dodger and new drop down clears to make a fully enclosed cockpit. Life lines. Harnesses. 6 pax liferaft, grab bag, comprehensive medical inventory. 8x 6V house battery banks, new in 2015. 12V separate battery for electronics, new in 2016. 24V starting batteries, new in 2018. New Pioneer cockpit stereo/ CD/ USB. 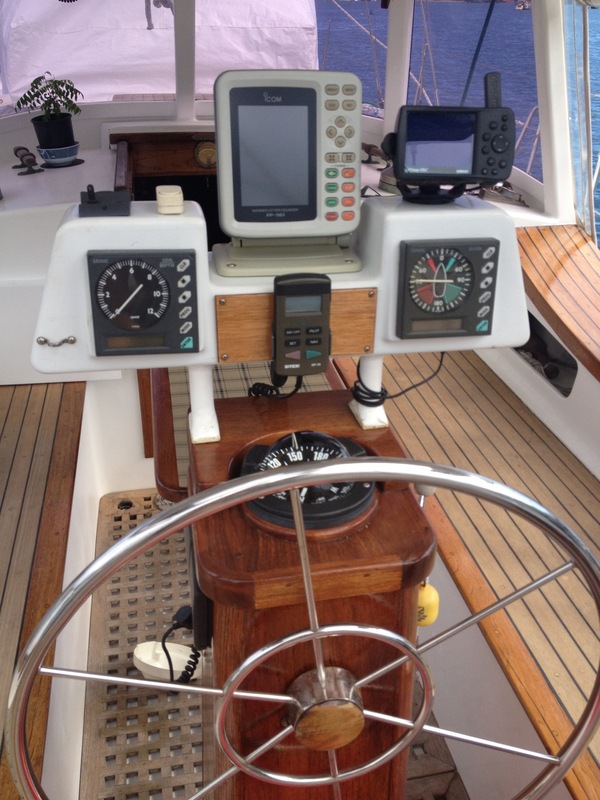 Sitex autopilot – 2 control stations – at helm and repeater at nav table (plus complete new spare unit in box). Garmin 551S GPS/ chart plotter (with sounder option), new in 2012. Furuno 24 mile radar. Icom GPS/ depth sounder/ fish finder. Garmin 38 handheld GPS. Icom IC M-422 VHF, new in 2012. Icom IC 710 SSB (open to all frequencies/ HAM Radio). VDO wind speed/ direction and log. 4x new 12V 90W solar-panels. 1x 12V 50W solar panel to service electronics battery. AirMax wind generator recently serviced (new blades and bearings etc). 2x 100 amp alternators on main engine with parallel switches. 1800W ProSine inverter. 30 amps battery charger. 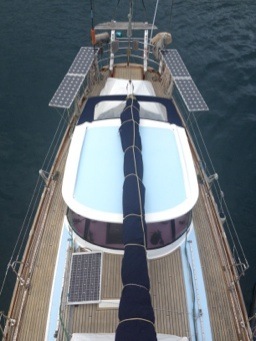 Mainsail by Willis Sails NZ with Lazy Jacks. 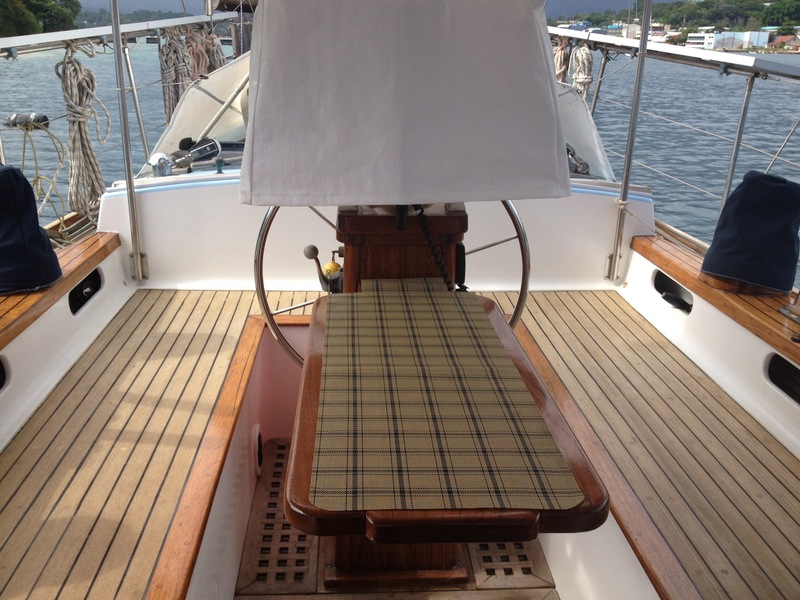 Genoa (125%) by Willis Sails NZ on Furlex furler. Nearly new. Very little hours. Yankee/ Doyle sails , (also for furler). 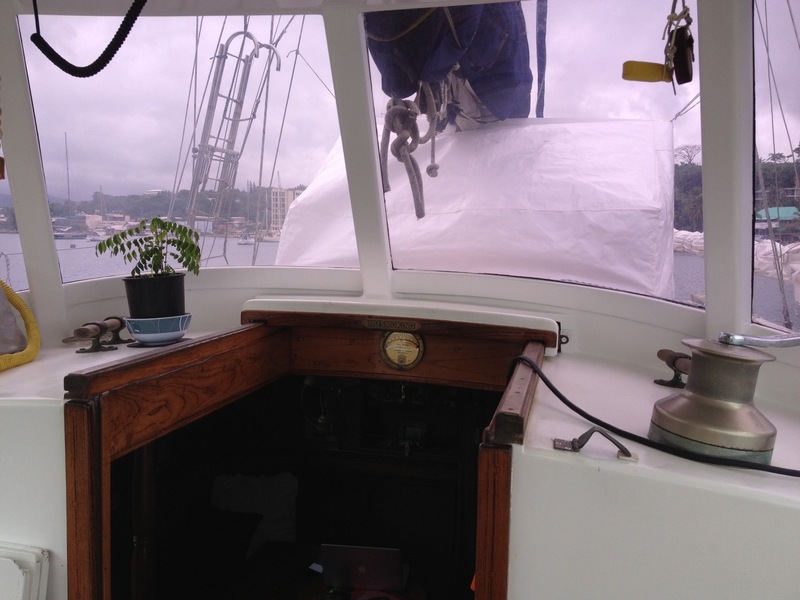 Staysail/Doyle sails , recently serviced. Selftacking staysail track. Spare Main x2, Genoa, nr 1,2,3. Storm-sail. Spinnaker, nearly new. MPS. 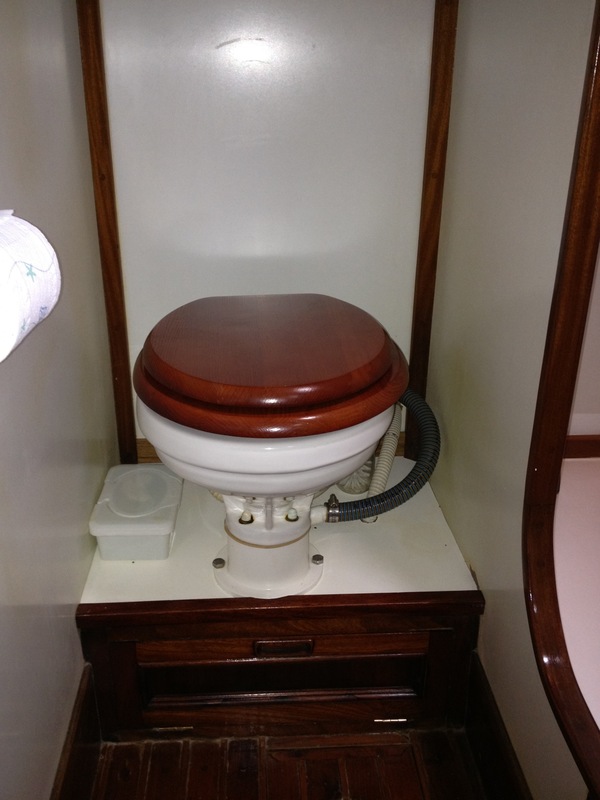 Vessel is presented in near immaculate condition. 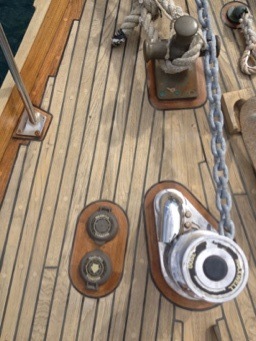 Teak decks refurbishment; all hardware was removed from the decks and all deck-fasteners were removed, all screws removed and planking re- fastened with epoxy glued dowels and teak bungs. New caulking. For every piece of hardware new teak inlays were made, these inlays are supported with 2” hardwood reinforcement blocks underneath to ensure a strong and watertight base for the new fastening bolts bedded in threaded reinforced epoxy. All inlays are varnished which accentuate her classic heritage. All chain-plates were inspected and improved accessibility was made for future service. 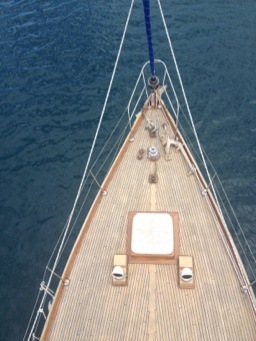 New genoa track inlay in teak and refastened in threaded reinforced epoxy. 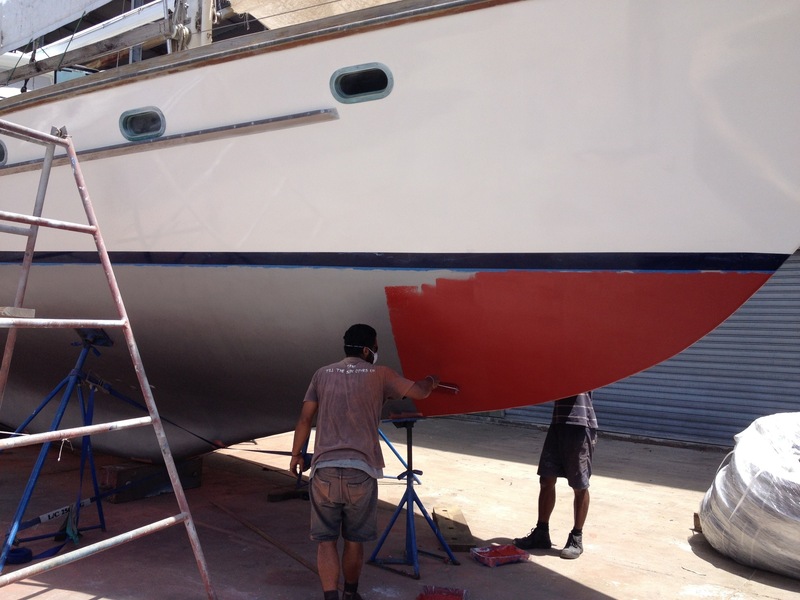 New paint job on hull and superstructure – Alltex paints 2011. New engine heat exchanger 2011. New anchor chain 110 meters of galvanized 13mm installed in 2012. New house batteries 2012, 8x 6V. New electronics battery 12V./ 2017 Sails lofted and serviced Oct 2013. Last haul out in Noumea, New Caledonia in August 2016. 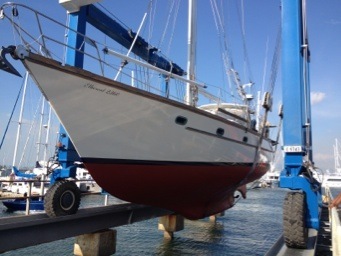 Anti fouled with Carboline Seabarrier 3000 a very effective paint. Mast pulled and painted, new hardwood mast-step installed with new aluminum base plate, rigging checked and tuned, new electrical wiring and new Windex and Nav lights on mast. Winches overhauled, greased and secured with new SS bolts.